Prof. M.P. Gupta, Head of the Dept. of Management Studies, after lightening the holy lamp along with all other dignitaries, addressed the audience. Connecting this auspicious occasion with the 1st day of Navaratri (the same day), Sir presented optimistic viewpoints regarding the grand collaborative arenas. After that, Dr. Ajay Kumar Garg enlightened the audience on the topic “Policy issues of Digital India, Make in India and Digital Trade”. Sir elaborated on the power of IT and how IT 2.0 is again going to create a boom in Indian economy. Then he elucidated on the present scenario of world economy and trade and the huge potential for India to scale up and become the market leader of IT Outsourcing in Europe too (already having large outsourcing market in US). Moreover, he emphasized on issues like upcoming challenges to be overcome, facilitation by the new Govt., digital India, next gen solutions for consumers, IoT, industry 4.0 with a special focus on data privacy. Dr. Vipin Tyagi graced the stage next with the agenda of “Innovations and Start Ups – Lessons from EU”. First of all, he delineated the unpredictability of road maps, hurdles in the execution of policies and emphasized that the focus of authority should not only be on planning. He then pointed out the aspects of cyber security, wealth creation from digital trade, the recent developments in internet and wireless networks, and development of security standards; also why it is required to change the mindset of Indian consumers, advent of a strong instrument like social media and problems with implementation with respect to planning. Next, he emphasized about the importance of working with the semiconductor players for ecosystem generation and how collaboration with EU will bring a whole new change. Then the audience had a brief interactive session with Sir on issues like advent of driverless cars, stretched focus on computing and the gaps arising in between planning and implementation. The event obtained a new perspective, when the forum engulfed with lots of Indian viewpoints came up by the visionary speech by Dr. Klaus Pendl with an added flavor of practicality on the agenda of “The EU-India Digital – Opportunities and Challenges”. He appreciated and elaborated the importance of India to Europe as a key country, the common interests of both the entities; simultaneously he provided the information regarding recent progress of the initiatives since the last India-EU summit. He focused on issues like facilitation of trade, ICT standardization, research and Innovation, advent and impact of 5G, intelligent transport systems, hackathon and suggested the integration of academic institutions and startups to boost economy. After these pragmatic and envisioning speeches, a panel was formed headed by Mr. Jaijit Bhattacharya (as a moderator of the discussion) to discuss and provide the topic further dimensions. After a quick round of introduction by each of the speakers on the topic, it was time for broad discussion. 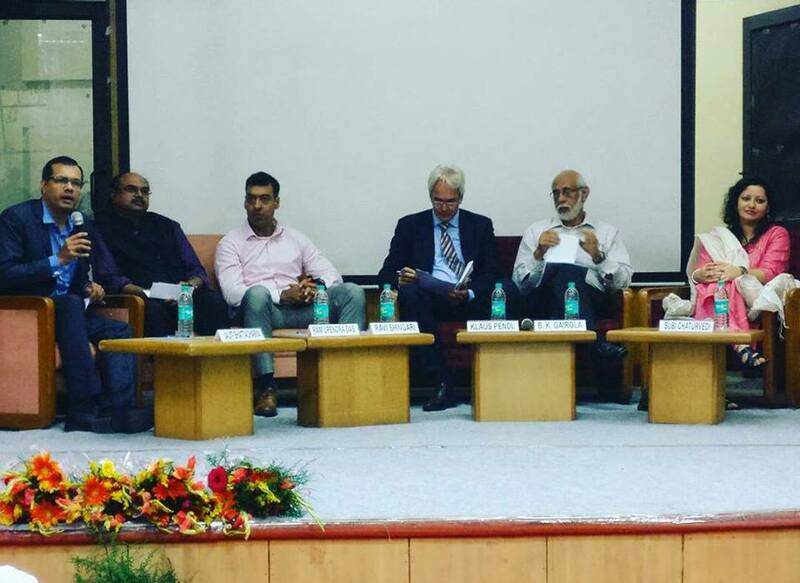 Dr. Gairola started with his opinion – Sir drew similarity between digital India and the initiatives taken by Europe. He also structured the digital initiatives into 3 basic components – infrastructure, information and Investment. He emphasized on the fact that common man can’t pay for broadband, therefore ‘Technology for last mile’ should be the prime focus for the authority. He also provided a new aspect of liberating information from the domain of Govt. to be used for everybody, open data, open to tier 2/3 cities. Moreover, he illustrated the aspects with the example of BBC machines and the revolution it brought around. Next, Ms. Subi chaturvedi dazzled the forum with interesting attributes of digital initiatives – ‘Disruptive but enabling’, ‘Technology and democracy’ and ‘Making of Policy to cater to the poor’. She then provided insights on creating opportunities and collaboration for change through key programs like Digital India, policy governance, Govt. products for fulfilling the demand of rural broadband and the aspects of cyber security. She also emphasized on breaking out of silos and collaborating for transfer of technology and capacity building. Thereafter, intersection of technology with trade and other functional areas; he also focused on providing digital solutions to the bottom of the pyramid and reaching to rural Indian farmers connected through digital India. Next, Mr. Singhari brought a new perspective to the discussion – he elaborated on Tax on digital issues and contemplated with examples like OECD and G20 action plan BETS innovative profit shifting, Google and other companies paying zero case and cited the Vodafone case too. He advocated aligning taxes with activities of the corporate entities. He also elucidated the aspects of virtual business presence of companies in different countries and how India and EU can devise a transparent tax structure so that the companies do not have to pay taxes in both the countries and therefore a fruitful business environment full of synergy can be obtained and therefore trade can be facilitated. He further explored into the arena of advent of GST, consequent remedial for dual taxation and subsequent impact on ecommerce companies. He also pointed out the avenue for budding startups to find easier through the instruments like Tax treaty with most EU countries, FTA and FDI allowance. Dr. Pendl opined his viewpoints on international road blocks in international trade, effects of BREXIT, probable reduction of jobs. Further he formulated roadmaps for issues like ‘cost in the arena of internet governance’, FDI and balanced trade. Then he praised the new Indian Govt. on the initiatives that it is taking but also pleaded the Govt. to come out of the protectionist approach and to be more engaged internationally on ICT issues. Then Dr. Gairola concluded focusing on the larger vision of India EU joint initiative from the digital eyes emphasizing on Open source technology to suit our requirements, defining of standards, cutting down costs, pushing internet towards the bottom of the pyramid, getting out of hegemony of corporate hegemony, developing open source corporate giants and the corresponding sizable effort required to achieve that. Next, Ms. Subi chaturvedi dazzled the forum with interesting attributes of digital initiatives – ‘Disruptive but enabling’, ‘Technology and democracy’ and ‘Making of Policy to cater to the poor’. She then provided insights on creating opportunities and collaboration for change through key programs like Digital India, policy governance, Govt. products for fulfilling the demand of rural broadband and the aspects of cyber security. She also emphasized on breaking out of silos and collaborating for transfer of technology and capacity building. Thereafter, intersection of technology with trade and other functional areas; he also focused on providing digital solutions to the bottom of the pyramid and reaching to rural Indian farmers connected through digital India. Next, Mr. Singhari brought a new perspective to the discussion – he elaborated on Tax on digital issues and contemplated with examples like OECD and G20 action plan BETS innovative profit shifting, Google and other companies paying zero case and cited the Vodafone case too. He advocated aligning taxes with activities of the corporate entities. He also elucidated the aspects of virtual business presence of companies in different countries and how India and EU can devise a transparent tax structure so that the companies do not have to pay taxes in both the countries and therefore a fruitful business environment full of synergy can be obtained and therefore trade can be facilitated. He further explored into the arena of advent of GST, consequent remedial for dual taxation and subsequent impact on ecommerce companies. He also pointed out the avenue for budding startups to find easier through the instruments like Tax treaty with most EU countries, FTA and FDI allowance. Dr. Pendl shared his viewpoints on international road blocks in international trade, effects of BREXIT, probable reduction of jobs. Further he formulated roadmaps for issues like ‘cost in the arena of internet governance’, FDI and balanced trade. Then he praised the new Indian Govt. on the initiatives that it is taking but also pleaded the Govt. to come out of the protectionist approach and to be more engaged internationally on ICT issues. Then Dr. Gairola concluded focusing on the larger vision of India EU joint initiative from the digital eyes emphasizing on Open source technology to suit our requirements, defining of standards, cutting down costs, pushing internet towards the bottom of the pyramid, getting out of hegemony of corporate hegemony, developing open source corporate giants and the corresponding sizable effort required to achieve that. After that, the forum was made open for questions and answers session for the audience present. The enthusiastic audience after contemplating the discussion came forward to bring clarity to their doubts in issues like initiatives to be taken by home grown companies in the aspects of disruption and innovation, incorporating feedback mechanism in designing of services and products etc. The eminent panelists elucidated their opinions on these and provided a futuristic vision to the inquisitive audience. Thus, a summit of vision, insights and channels of collaboration came to an end for the day but this was just the beginning. The rich discussion left the audience with sufficient food for thought and lots of enthusiasm to make a change and achieve greater goals. Moreover, fulfilling its purpose, this discussion enhanced the platform, the prospects and the roadmaps of India-EU digital collaboration with optimist vision. The Department of Management Studies is a result of the evolutionary process of growth of an idea floated in 1963. What was then a seed, gradually came to life and in 1974, IIT Delhi set up an internal committee to scrutinize the functioning of the management area in the institute. In 1975, an expert committee was setup to formally examine the possibility of launching this area in a more sustained fashion. The result was an M.Tech programme in "Management Systems" in the School for System Studies, (subsequently renamed School for Systems and Management Studies). The year 1978 saw the setting up of the Management Core Group and the core inputs to a full time Management Education at IIT(D) were reconfirmed by an Advisory Committee constituted by the representatives of the Academia and the industry. Since then, there has been no looking back. The School for Systems and Management Studies became the Centre for Systems and Management Studies. This was subsequently renamed as the Centre for Management Studies. In 1993 the Department was brought into existence by amendment to IIT (D) statutes. Clearly, the Department responds to a felt need of the Indian Industry and derives satisfaction from its heavy field orientation in all its curriculum activity. In response to the feedback from the students, alumni and industry, the Department of Management Studies launched MBA programmes in 1997. The department currently runs a two year full time MBA programme (General and with focus on Telecommunication Systems Management) and a three year part time MBA programme (with focus on Technology Management). MBA program in IIT Delhi is designed keeping in mind the changes in business environment and the need of the industry. Our academic program is comparable to the best that are available in the world class business schools for creating managers to face the new challenges of the ever changing market environment. The entire course aims at creating holistic managers trained by a very eminent faculty, which is also supported by the experienced professionals as external faculty from India and abroad. The students are admitted through a rigorous screening process that includes CAT score, group discussion and interview. IITD MBAs are known to do well.